The Alliance is a European based International Non Governmental Youth Organisation, officially registered in Denmark since 2005. To provide voluntary service organisations with opportunities to discuss and exchange experience and information within Europe. To facilitate and improve the co-operation between voluntary service organisations. To look after the interests of its members through exercising influence on international bodies involved in voluntary service, youth policy, youth training and youth exchange, as an initiative for the furtherance of youth exchange and voluntary service. To inform members about debates and developments at a European and non-European level which are of relevance to the members. The Alliance aims at the widest possible co-operation at a European and a non-European level. The EC ensures that the functioning of the Alliance is in accordance with the common interest of its members. The highest decisional body in the Alliance is the General Assembly of members which gathers every year on November. All full and associate members are entitled to vote and any member or Working Group/Committee can submit proposals or motions for adoption. The Executive Committee (EC) is in charge of the management and the operation of the Alliance in accordance with the decisions of the General Assembly of members. It is accountable for its decisions to the GA and its members are elected every two years by the GA. 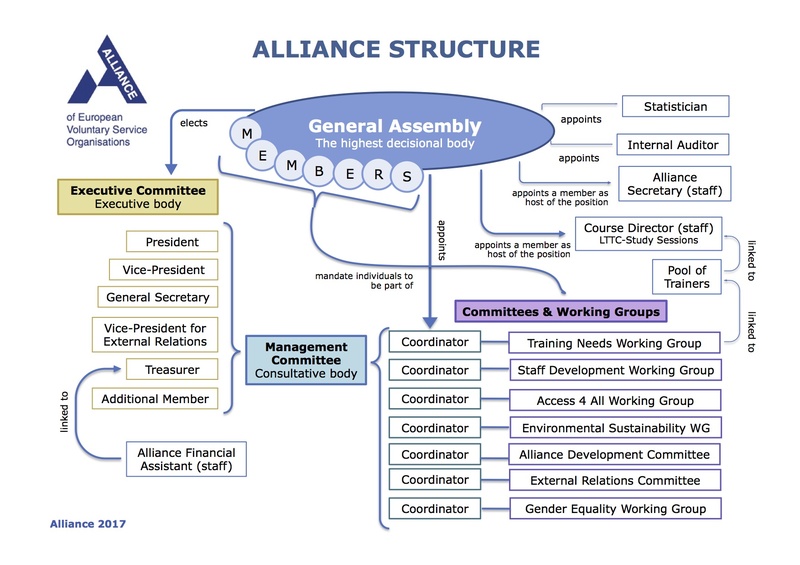 The Management Committee (MC) is the consultative body of the Alliance. It is formed of the coordinators of the five Working Groups and 2 Committees, and the EC members. Following the Constitution, every year the GA appoints several positions to individuals mandated by member organisations to represent the network, coordinate groups or develop specific tasks. These positions are the coordinators of the Working Groups and Committees, the Statistician and the Internal Auditor. The GA is also in charge of appointing member organisations to host the Alliance Secretariat and the Course Director staff positions. The staff are then selected by the Executive Committee.